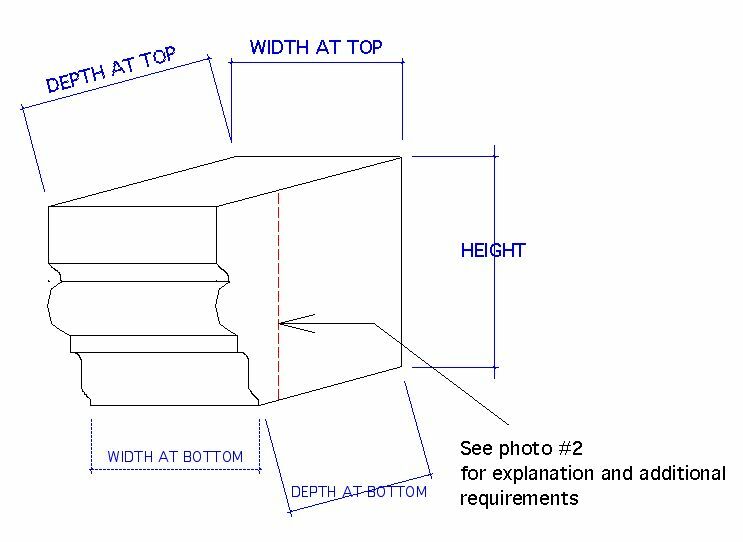 One day in April, 2005 I received an email asking if I had ten of my #100 corbels, and could the design be used on a house restoration. 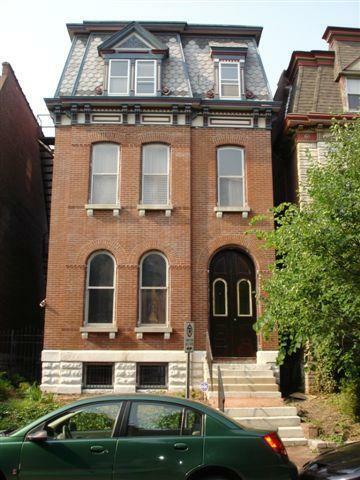 The email was the beginning of a restoration project on a Victorian era brick house located in a historic district in St Louis Missouri. 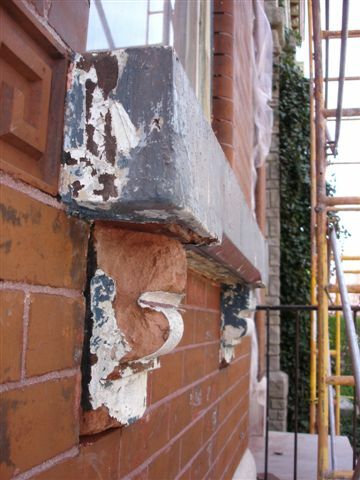 At this stage it was discovered that the original sandstone corbels under each window sill, as well as the stone sills themselves had deteriorated beyond reasonable repair. 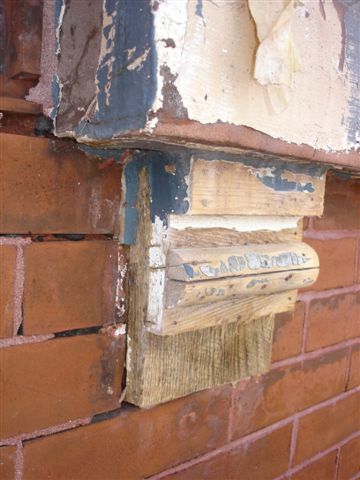 Indeed, some of the corbels had deteriorated so badly they had been removed long ago, the holes patched with cement, and pseudo corbels made of scraps of wood were attached to the facade over the holes. 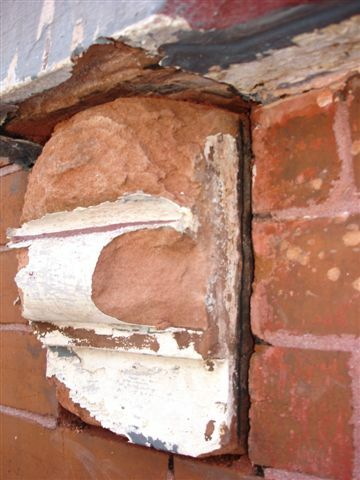 Sandstone used on building facades was notorious for rapidly deteriorating, a fact discovered within a few years after it's first use on facades circa 1870. Layers of paint had concealed the fact that some of the sandstone corbels had been replaced with wood, and this was discovered when the paint was stripped from the facade by the contractors. 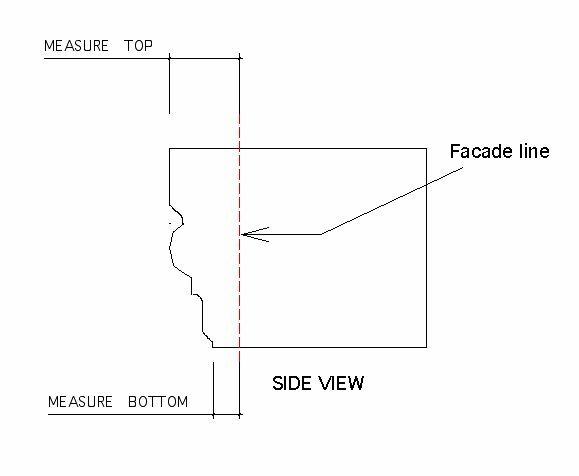 The client's initial idea of replacing these with my #100 corbel was not going to be feasible due to size, shape and design differences. 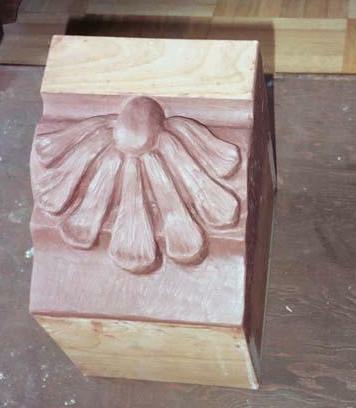 It was then that I suggested the idea of in-house sculpting of a clay model based on detailed photos and measurements of the original corbels was not only a viable alternative, but one which could offer some custom design possibilities at a reasonable cost- provided there was enough lead time before the masons and scaffolding were scheduled to depart. The idea was well received and it began a rapid series of emails, we decided that since the window sills were going to be replaced with white limestone, the replacement corbels would be cast in pure white concrete which would provide a cost-effective and durable material with a very close color match to the new sills. The clients desired a fancier design than the admittedly boring originals, it was suggested that a modified palm leaf design would look appropriate to the style of the house and complement the terra cotta Greek fret design band on the facade's lower level. I immediately began sculpting the clay model to make the production mold from, and the subsequent ten required castings. Within a day or two the roughed out design was approved by the clients with but one minor request of two additional petals to be added to the palm leaf design. "We're very pleased with the design! Let 'er rip!" Time being a major factor with the new sills having been already ordered and due to be delivered in about two weeks, (in the end they were delayed by several weeks!) 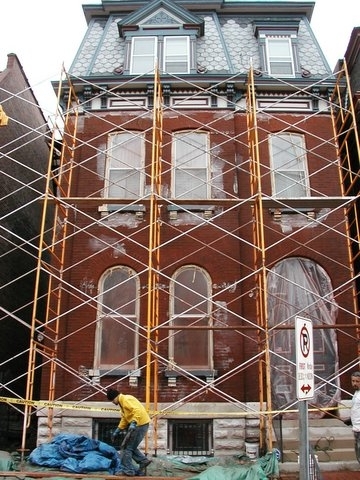 the facade already stripped of paint and tuck pointed, there was no room for delay, or errors, yet there can be no rushing the proper cure of concrete and it's minimum of seven days kept damp- preferably in plastic wrap. With the mold made in one day over the weekend, the concrete was poured in 36 to 48 hour cycles regardless of the time of day. Casts were even poured at midnight and on Sunday to meet the project deadlines. While the production was going on, the first couple of casts which were now cured, were shipped DHL ground service to the client and arrived in St. Louis overnight but were delivered the following day. Four more were shipped a few days later as they in turn passed the critical damp cure period. And now we have additional photos of the completed project thanks to the proud client who furnished these photos. 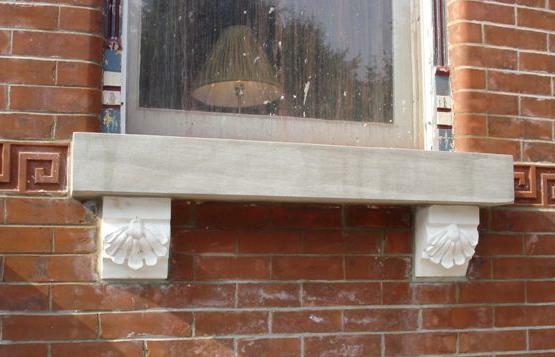 Closeup view of one of the windows, all the window sills were replaced with new cut limestone, my corbels fit perfectly in the existing holes. A view a little further away showing more of the facade. 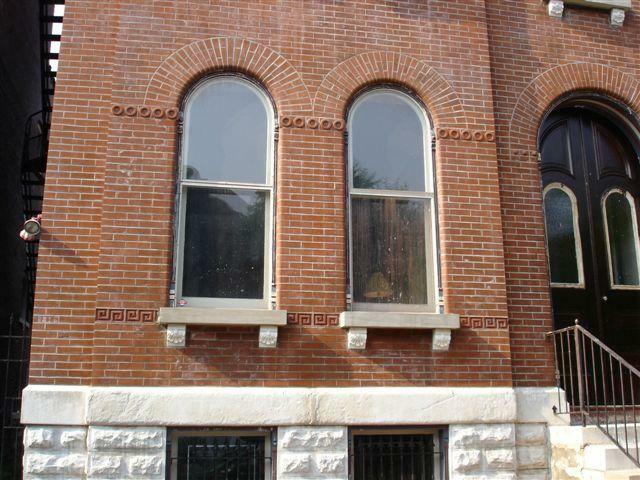 And the last photo shows the gorgeous victorian facade from across the street. 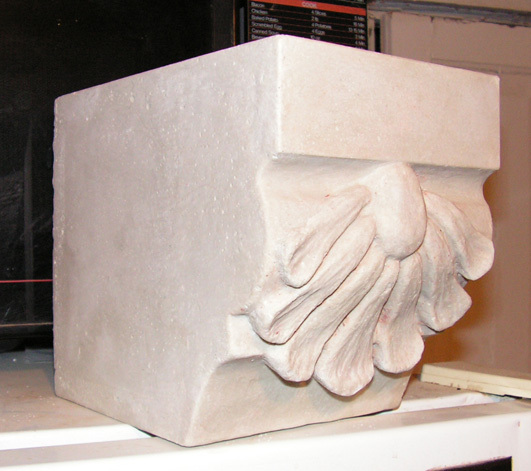 A monument sized sculpture project Restoration of fragments and replication of a 38" tall 1897 Corinthian capital from the Philadelphia Commercial Museum. Stop by again for more photos of the client's restoration of this 19th century victorian gem, and possibly a custom cast plaster ceiling furnished by Randall's Urban Sculptures.